Tutorials to get you started with the Google Web Toolkit. Clientside GChart seems to have stopped development for more than a year. gflot is - well - too much "plot"-like for what I need. I will try GWT Highcharts and Arcadiacharts and share my experience with you soon. Support for html5-canvas. The gwtcanvas-project has been in the incubator for almost three years but now it is finally an official part of GWT. Really cool is the fact that even outdated Internet-Explorer versions are supported through VML. Finally a GUI-designer has made its way into GWT. It may be not as advanced as other UI-builders but it is already a great help for internface creation. Support for touchscreens as found in smartphones with gwt-touch. In the early days people used "applications" that could be bought at many different places online or in a store. Nowadays they use "apps" that are sold through closed channels controlled by the big hardware manufacturers. So its not to my surprise that google added support for the "android apps marketplace" to GWT. I have a new GWT project planned and will post some tutorials covering the new technologies that I have to learn in the course of the development. At last years Google IO Ray Ryan presented a collection of architecture recommendations for GWT applications based on what the team found best practices when developing the new AdWords application at Google. This guy took the effort to transcribe the complete presentation and even included all the slides. The presented technologies were: MVP, Display Interface and EventBus. Now Google has published a new introductory article covering everything mentioned in Ray's presentation and a lot more. Dependency Injection - What ist that good for and how do I use it? Both solutions have the calendar-class tightly coupled to the entries-class. This resulting in the issue that if you want to use entries from another source, you have to change the code of the calendar class! Why is tight coupling a problem? Tight coupling is not a problem in general as long as you work on a small project in an environment completely controlled by one developer. As soon as a team is involved or unit testing is necessary, the tight coupling could become a huge issue soon. To use PHP on the server side in combination with a GWT client-application makes a lot of sense, since most inexpensive webhosting solutions permit you at least to run PHP on their machines. 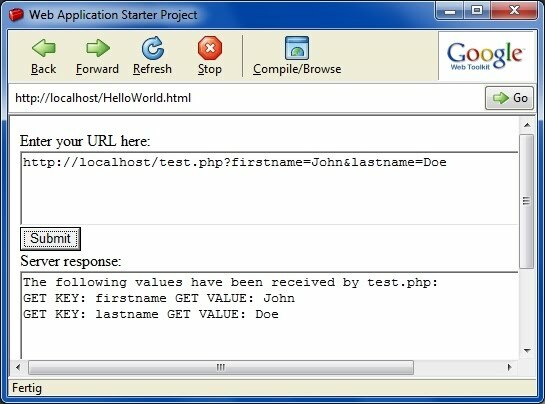 In this tutorial I demonstrate the basic steps for calling a PHP script from a GWT application using HTTP GET. The finished "masterpiece" will look like this. You enter the URL + GET parameters of your PHP script in the inputField. Click "submit" and the application will display the server's response. As described here the "Same Origin Policy" requires the PHP script to reside on the same server where your GWT code is. 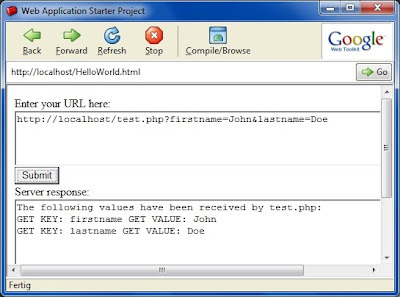 To develop your application on your local computer you probably have to start with the installation of a local webserver. In order to run PHP code on your local machine it makes sense to install a local development server as described in this tutorial. This is just a matter of minutes if you use the pre-configured XAMPP package as suggested in the tutorial. For testing purposes I use this small PHP script that will simply echo out the input it receives to the sender. 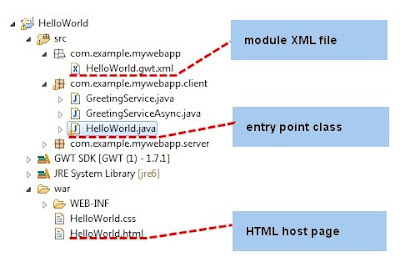 In order to be able to use the HTTP-methods in GWT you have to include the following line of code to your module-xml file (HelloWorld.gwt.xml). See this tutorial for details. // add some widgets to the user interface. When firing a server query you need to process the server's response asynchronously since it would be a bad idea to freeze the application until the response has arrived. This is done in "doGet" with a RequestCallback object whose "onResponseReceived" method is executed by the time the response arrives. "onResponseReceived" then calls my own method (processResponse) to which it passes the response-string it received (the output of the PHP script). "processResponse" is very simple: It just displays the server's response in the "outputField". This method does the actual work. It calls the url you have enterd in the inputField and creates a callback object whose "onResponseReceived" method is executed by the time the response arrives. This method calls "processResponse" shown above and passes on the returned string. OK, why would you want to do this? Calling a PHP or Perl script from your GWT application can be a real challenge since the local webserver used by GWT (Jetty) is by default not able to execute scripts. Placing the script on a remote server where PHP can be executed is not an option, since that collides with your browser's Same Origin Policy. This security mechanism requires that your script is located at the same location where your GWT code resides. So if you want to combine GWT with PHP or perl(python? ...) and still develop and test your GWT application locally, you have to be able to run scripts on your local machine. The easiest way to do this, is to replace the GWT built-in jetty server with a pre-configured local webserver package. I am sure there is also a way to tell jetty how to read PHP, but if you don't need any server-side java, it's easier to use apache. First you have to download and install a local webserver. 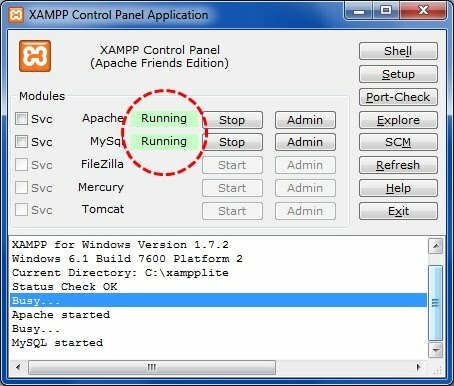 I recommend that you use the XAMPP-package which bundles a web server, MySQL, PHP and a lot more. The installation is quick and they have versions for Windows, OSX, Linux and Solaris. I chose the "light" version since it included all the tools I needed for the beginning. Check if the local webserver is up and running by calling "http://localhost" from your browser. The XAMPP startpage should open up. If you don't have a server-response on "http://localhost", make sure that the local webserver has actually been started. Start the XAMPP control panel application and check if apache is running. You need to copy a couple of files from your Eclipse workspace to the XAMPP server home-directory for hosted mode browsing to work. Check the script-tag in your HTML host page (HelloWorld.html) for the correct name and path of your *.nocache.js file. In order to have GWT actually use the local webserver you have to make some modifications in your Eclipse run-configuration. 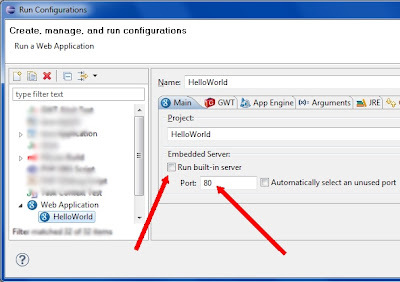 Right-click on your "HelloWorld" project in Eclipse and choose "Run As -> Run Configurations". 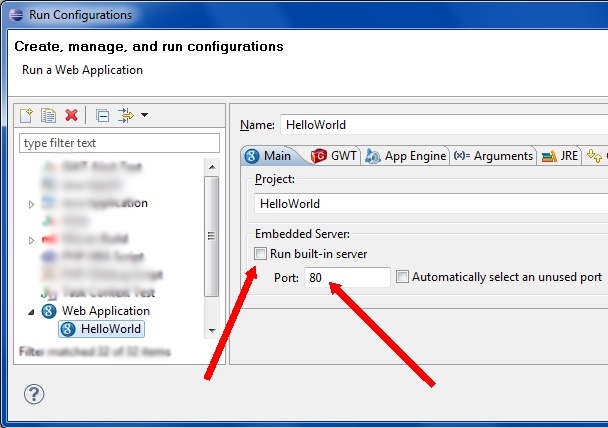 In the run configuration editor choose your "HelloWorld" application from the "Web Application" section on the left. Select the "Main" tab on the right side of the editor. Deselect the checkbox "Run built-in server" and change the port to 80. That's it. If you start your GWT application, you can see in the hosted mode url-bar that it is served by apache (port 80 on localhost). Your GWT app now can use any script that is located on your local web server. A local webserver behaves like a "real" webserver. This means that your machine can be contacted on port 80 from the outside. Usually this port is blocked by your DSL or cable modem but in order to make sure, you might want to run a web-based portscan that checks for open ports on your computer. If in doubt: shut apache down! In this post I show you the very basics of file organization in a GWT project. A comprehensive overview covering all aspects of project organization can be found on the main GWT page. a module XML file telling GWT where to find its properties. 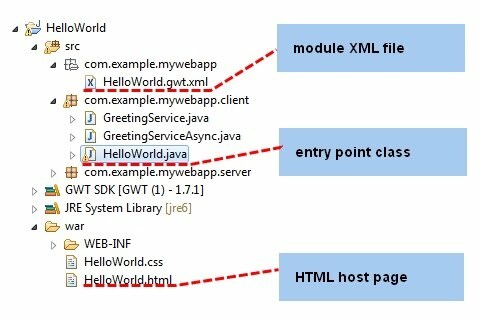 an entry point class (this is the .java class with the "onModuleLoad" method). a HTML host page that is called from the browser to start your application. This is the main configuration file for GWT. Here you tell GWT where to find your entry point class. You define a CSS stylesheet and inherit external modules. Don't worry about the content of the file at this point. If you double-click on the module XML file, the XML-Editor opens up by default. I use the text-editor instead. To open the XML-file with the text editor right-click on the filename in the Eclipse Project-Explorer and select "Open With -> Text Editor". All of your coding starts here. This class is the main entry point of your application. It must implement the interface "EntryPoint" and has to contain the public void method "onModuleLoad()".